Is it a good idea to delete old content from my website? Webinar - What Are Content Audits and How to Do Them Well Cleaning up your older content is just as important as adding fresh, new content to your site! Check out this webinar to learn the best way to handle your spring cleaning. Deleting old content is an excellent way to improve your site, boost your rankings and provide a better user experience—but only when done the right way. 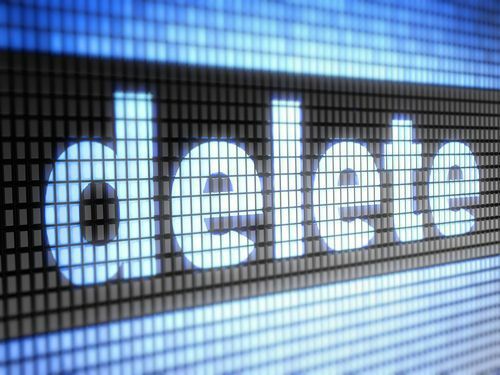 Before you begin the deletion process you'll need to determine which pages need to go. This process can be daunting, but it's necessary to the success of your website clean-up efforts. Your first step is to identify all the pages on your site that haven't been viewed in a year or longer. Once you have your list of neglected content in hand, you'll have to decide if the content on the pages is worth saving or not. Is the information in the article relevant and timely? Is it stuffed with keywords and little to no real information? Has it been modified before and still isn't performing well? Are page views extremely low? If the answer to any or all of these questions is no, then it's probably a good idea to delete the page. But before you begin deleting left and right, know that there is a right and a wrong way to delete bad content. If you do it right, Google will reward you. If you do it wrong, your SEO rankings could take a serious hit. The most important thing to remember when deleting content is this: Never ever delete without implementing a 301 redirect. It doesn't matter if you don't think anyone will ever find the page, you must redirect traffic. Period! If you fail to do so, anyone who happens upon the deleted content will be shown a 404 error page. Now, 404 error pages don't just undermine confidence in your abilities; Google hates them. If you have too many 404 error pages your site will under perform. If you're using DSS, implementing a 301 redirect is simple. We have built an automatic redirect into the page deletion process. This way you're reminded to pick a relevant page to redirect to each and every time you delete a page. If you're not a FWM client, then you'll need to get with your webmaster and ensure that each deleted page is properly redirected. First choice: Redirect to a relevant related page. Second choice: Redirect to a relevant practice area page. Third choice: Redirect to an associated overview page. Under no circumstances should you link to your home page. Google doesn't like this and neither will website visitors. What they're looking for is information that answers their search query. So if they search for "Why my bunions hurt when it rains?" they should, at the very least, find information about painful bunions. And one more thing: you'll need to repeat the 301 redirect process each time you delete a page. There is no quick fix here, no way to delete and redirect 10 pages at a time. Is it Tedious to do a Content Audit? Yes. Worth the Effort? YES! Don't let the process of identifying bad content and deleting it intimidate you. Deleting irrelevant, unviewed content may be painstaking, but it's pretty much guaranteed to boost your search engine rankings and improve user experience. Just like all white hat, ethical SEO techniques, there is no silver bullet to ridding your site of old content. So dig in and get it done; the sooner the better! Once you have removed the bad content you should be left with only great content that attracts more business. If you'd like help better understanding this process, call 888-886-0939. Top Secret Advice for Highly Effective Content Creation, Revealed!